Secluded and skewed, the towering stump of an ancient cedar stands in a quiet place in Stanley Park, the spectacular city park of Vancouver. A bus with tourists in this oasis of greenery, a piece of rainforest on a peninsula near the city centre, passes by and stops for a moment in the drizzle. People take pictures of the weathered, hollow tree, silently leaning on a pair of support poles, like a motionless senior with a walker. The dead cedar, which stood upright for about 1,000 years, is an historic attraction. Since the 19th century, people have come to the hollow tree, with its circumference of 17 meters, to have their photo taken in a huge opening at its base. The hole is so big that people backed into it with horse and carriage to pose for photographs. In the 20th century, the same was done with cars. The size of the tree illustrates the grandeur of the scenery on the West Coast, where trees can grow to 75 meters tall. Once, a man with an elephant even posed in the famous ‘Hollow Tree of Stanley Park’. 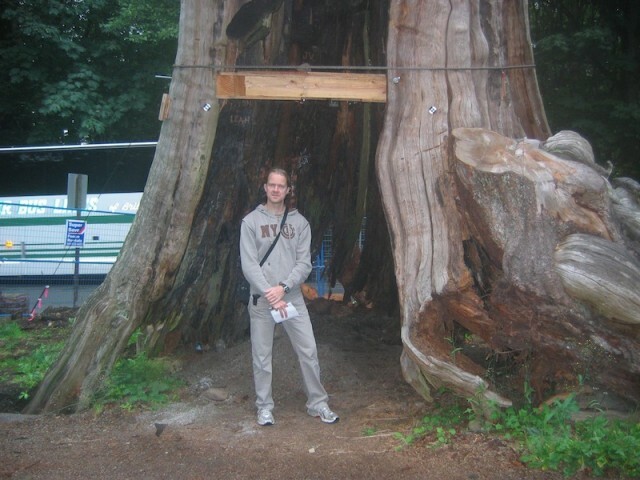 The author at the Hollow Tree of Stanley Park in Vancouver. That was then. Today, the hollow tree is in danger of falling over, battered by a severe storm in 2006. The stump, rotted away on the inside, but almost indestructible on the outside, now lists at a significant slant. Since then, the 13 meter stump has been propped up with temporary poles and cables. A security fence has been placed around it. A permanent structure to hold up the iconic tree would cost several hundreds of thousands of dollars – reason for the park board to decide this year that the Hollow Tree had reached the end after more than 1,000 years. It had to come down. That decision led to a storm of criticism, and a passionate campaign to save the hollow tree. Like the ‘Anne Frank tree’ in Amsterdam, a diseased chestnut that was saved after intense debate last year because Anne Frank could see it from the secret Annex, the fate of the Hollow Tree invokes strong emotions. A proposal by the park board to “lay the tree to rest” on its side, so that it can remain on display for visitors to the park, does not meet with Macdonald’s approval. He points to an engineering report which states that it is possible to restore the trunk to its upright position, with a permanent supporting structure on the inside. Critics reject that plan as “unnatural” and a waste of money. Nevertheless, the park board has agreed to postpone the proposed felling of the tree, to give the Hollow Tree Conservation Society an opportunity to raise funds to carry out that plan.